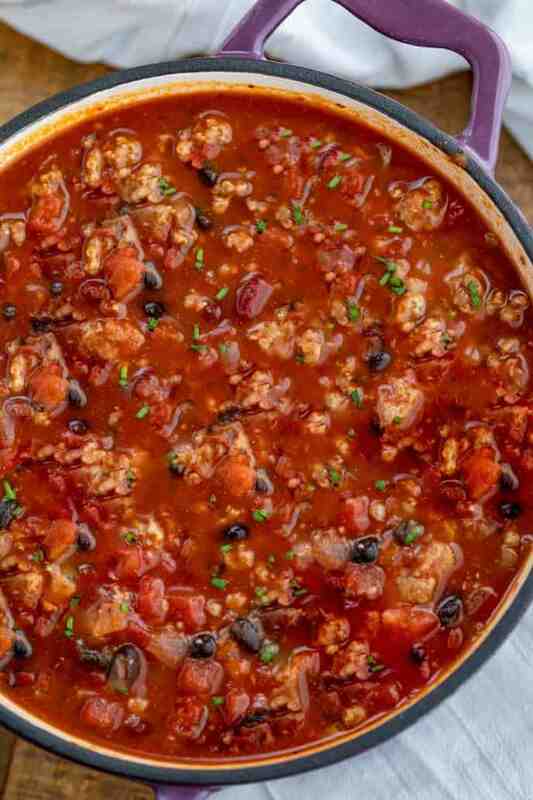 Turkey Chili is hearty and filling, made with ground turkey, crushed tomatoes, beans, and spicy seasoning in ONE POT, ready in under 60 minutes! It’s still cold outside, but we’re warming up in the kitchen with our favorite comfort foods, like Chicken Tortilla Soup, Cabbage Soup, and Slow Cooker Beef Chili! Turkey Chili is a hearty comfort food, while also being lower in fat than other chili recipes (like my super popular Classic Beef Chili). Plus it takes a total time of under 60 minutes, making this the perfect weeknight Tex-Mex dinner recipe! You can make this in a large dutch oven on the stovetop, or in the slow cooker. The slow cooker may take longer, but it cooks this chili low and slow, which is perfect for developing the flavors. This turkey chili recipe can be made even healthier with veggies like bell peppers, carrots, mushrooms, or zucchini. You can add more or less chili powder depending on how much flavor you like, and more cayenne for heat. Or if you’re in a rush, just use a pre-made packet of chili seasoning instead of chili powder! WHAT GOES WITH TURKEY CHILI? In a large skillet, brown the turkey with vegetable oil. Add to slow cooker. Add all other ingredients to the slow cooker and stir together. Cook on high for 4 hours, or on low for 8 hours. 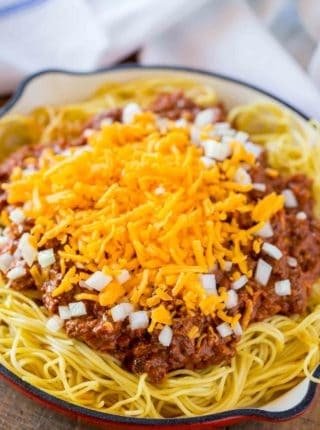 Stir the chili in the slow cooker, and serve topped with shredded cheese and chopped fresh cilantro. Add oil and ground turkey to the pot with the sauté function turned on, stirring until browned. Stir in the rest of the ingredients, then seal and lock to lid and pressure valve. Set the pot on high manual setting for 20 minutes, and release naturally. The instant pot is a lot faster than the slow cooker, but most instant pots have a slow cooker function, too. 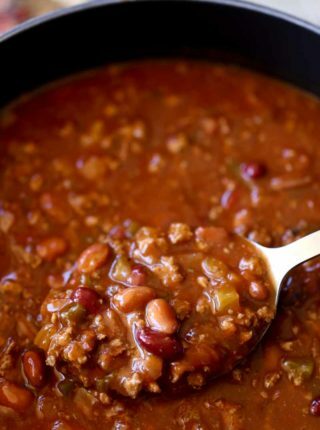 HOW LONG DOES TURKEY CHILI LAST? Leftover turkey chili will keep in the refrigerator for 3-4 days in an airtight container. Reheat in the microwave, or a saucepan, stirring before serving. 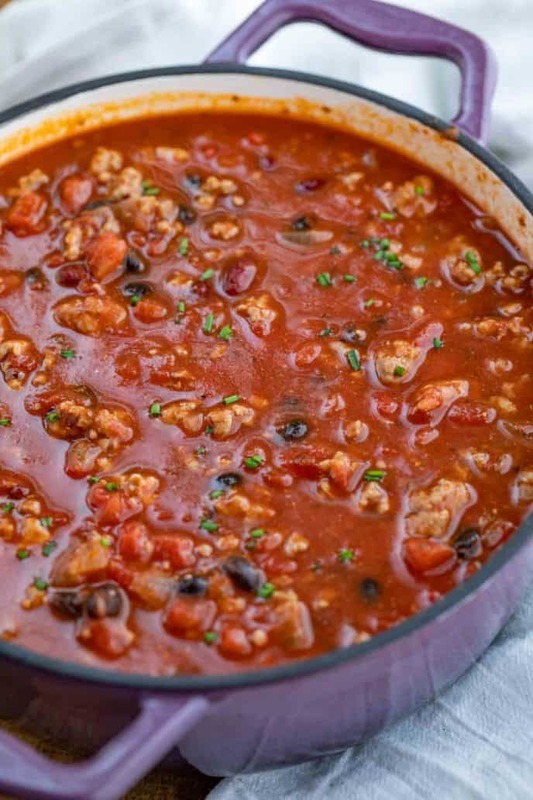 Turkey chili is perfect for prepping ahead of time and freezing for another day. Store in an airtight container for about 4-5 months, and defrost in the refrigerator the night before you want to serve it. Mix all of the spices together for a quick and easy chili powder recipe! Make this a low-sodium chili powder version by omitting the salt. 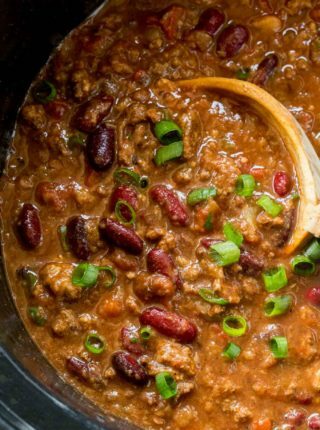 This is made with kidney beans and chili beans, but you can also use black beans if that’s what you have. 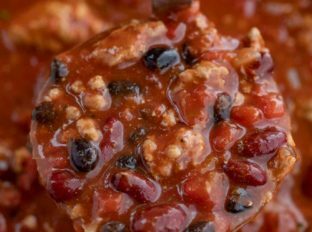 This recipe calls for ground turkey, but you can use this chili recipe for any other ground meat. Make this turkey chili recipe vegetarian by omitting the ground turkey and adding crumbled tofu instead. Press as much water from the tofu as possible using paper towels, then crumble into the chili. Personally, I prefer black beans instead of kidney beans when I’m making vegetarian chili. The black beans are smaller and match the texture of tofu chili better. This recipe is naturally dairy free and gluten-free if you don’t use cheese on top. 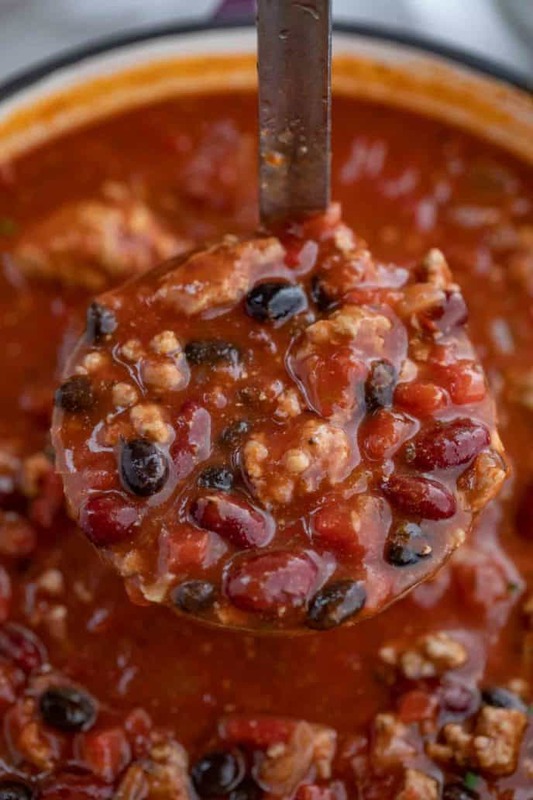 If you’re going for a healthy dinner with this easy turkey chili recipe, you can serve with fresh slices of bell peppers. You can also top with light sour cream and fat free cheese. If you don’t have crushed tomatoes you can use diced tomatoes. I like to set out some lime wedges on the table, for some fresh flavor. Serve topped with cilantro, lime wedges, and sliced pickled jalapeños. If you want even more flavor, use Chipotle seasoning or even a small amount of brown sugar. Add the vegetable oil, turkey, onion, garlic, salt and pepper to a large dutch oven on medium heat and cook, breaking it apart until cooked through, about 5-7 minutes. Add in the rest of the ingredients, bring to a boil then reduce to low heat, cover and simmer for 45 minutes. We love switching it up from regular beef chili and this Turkey version is so good. It’s nice to have a change every once in a while. mmm..I love everything about this! Its warm, hearty and delicious!! A must try! This recipe was so good! So much flavor! Thanks! I am making this today for a party! I can’t wait! 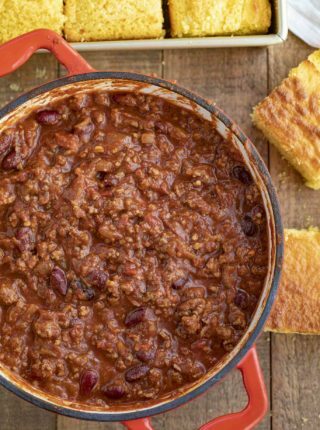 You can’t go wrong with this delicious chili recipe!